Japanese capsule toys are some of the most diverse and interesting trinkets available in Japan. Capsule toys are more commonly known in Japan as ‘gashapon’ and can be bought from so-called ‘gacha gacha’ vending machines. 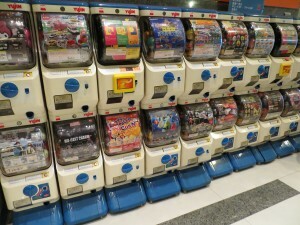 These machines can be found in many places, such as in game centers and outside supermarkets. The amount of machines with extremely affordable prices – usually 100 yen, but with larger toys stretching to 400 – has led to a huge variety of gashapon. From cute to weird and even cool, there’s a gashapon for you! 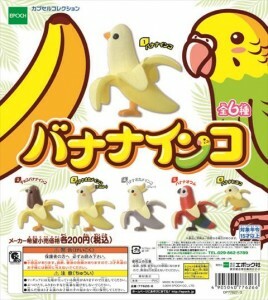 Cute Japanese Toys: Banana Birds, Dog Sandwiches & Cat Crepes Oh My! Not surprisingly, the most popular types of capsule toys are the ‘kawaii’ ones. Most gacha gacha machines will be filled to the brim with cute Japanese toys, many of them based around animals such as ‘Banana Inko’. 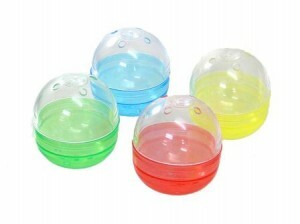 This series is a set of six parakeet toys. However, instead of being normal birds, they are shaped like bananas! They each have coloured skin that fans out, just like a normal banana skin. And in case there are those who prefer just bananas, there is an entire series dedicated to banana peels posing cutely called Banana’s Moe Pose! We’re not sure if they are supposed to be mimicking cute animals, or…humans. Actually, the combination of food and animals is very popular. One series is named Inupan and has been releasing new ones since the start of 2013. Now on its eighth series, this particular gashapon is a mix of bread and dog! The phone charms are various kinds of dogs, all inside different types of sandwiches and cakes. If you’ve ever wanted a Corgi in a hot dog, then this is the perfect gacha gacha series for you. 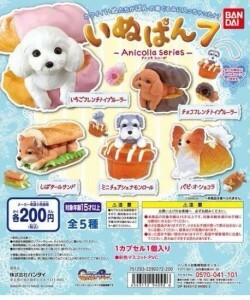 The latest series to be released featured toys such as a dog in a burger, and a Jack Russell in a sandwich. Maybe somebody is taking the term “hot dog” a bit too literally! If you don’t like birds or dogs, then there are still many possibilities for you. One example is Buneko. 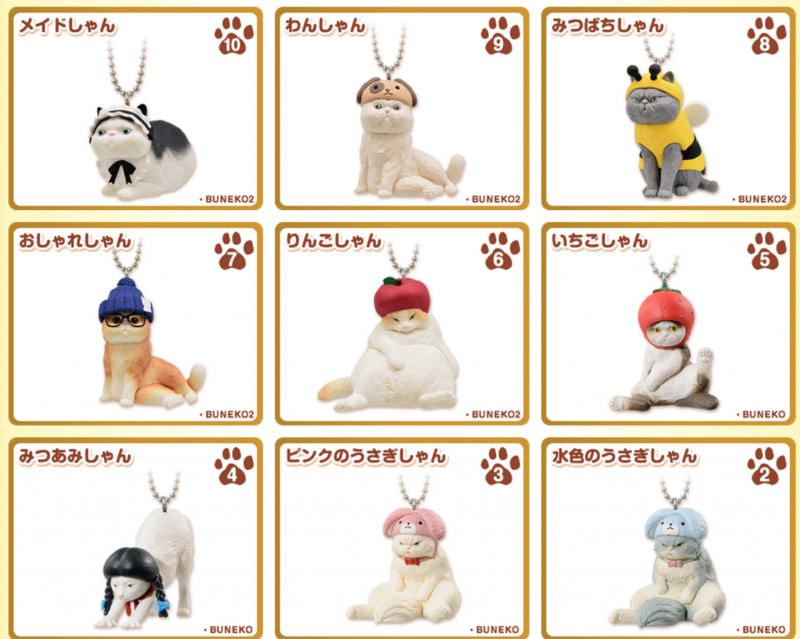 This series of capsule toys features cats in many different outfits, from a bee costume to a maid’s dress and even a ‘dog hat.’ Buneko varieties are extremely varied and of course cute. With the series being somewhat new – currently with only two series released – you can expect more clothed cats in the future. 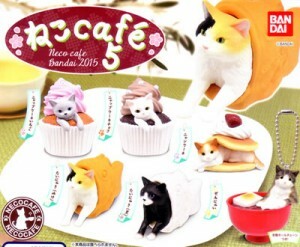 One more series for cat lovers is Neco Café 5. Much like Inupan did for dogs, this mixes cats and food. This brand new series currently consists of six different cats. Most of the foods are sweets, such as a chocolate or strawberry cupcake, but there is also a cat chilling in a bowl of Ramen available too. And then there is the series named Koppu no Fuchiko (meaning Fuchiko on the Edge of the Cup). This capsule toy contains a small, manga-ish woman in office lady attire. Each Fuchiko model is doing various poses and can hang off of your glass or cup. She may be hanging upside down, vaulting over your glass, or just peering to see what you’re drinking at breakfast. The capsule toy has become extremely popular in Japan, with other products now being made about her. The original series has seven figures. After cute gashapon, there is also the complete opposite: Weird Gashapon. Some series are so extremely odd that it is hard to believe that they exist! 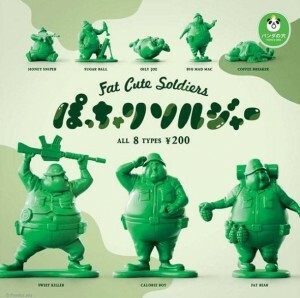 One of these weird Japanese toys series is called Fat Cute Soldiers. The capsule toy is exactly as the name suggests: Small green models of fat – but cute – soldiers. As a series of eight, you get characters such as Sweet Killer, Calorie Boy, Oily Joe and Big Mad Mac. Reminiscent of green army men toys, yet all blown up, this is one gashapon series that goes just to the edge of weird. 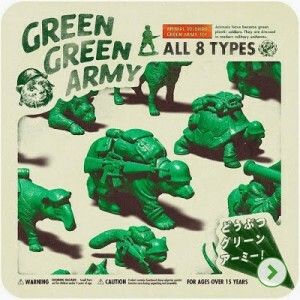 Another gashapon series based around the army theme is called Green Green Army. Instead of fat soldiers, this series of toys is based around different animals as army soldiers, complete with guns and other weaponry. These too are styled like green army men toys. If you’ve ever thought that your shelf needs a small model of a gorilla with a rocket launcher, or a leopard with a gas mask, then you’re in luck. These gashapon cost 200 yen each and there are eight to collect. Weird Gashapon are not only awesome to have for yourself—they also serve as conversation starters when someone sees your collection for the first time. After all, wouldn’t you question an armored polar bear on someone’s shelf? 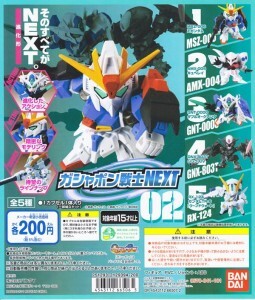 For Cool Japanese Toys: Go Mecha! ten based off of movies and anime like Gundam. For the sometimes slightly higher cost, they are an extremely cool thing to own. As a series they also come with different varieties, making it extremely tempting to collect them all. Just be sure you have enough shelf space to hold them all! 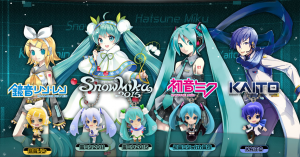 Hatsune Miku, the sensational pop star, and her other vocaloid friends have the most adorable chibi Gashapon! This specific capsule toy line is called the Hatsune Miku Swing series featuring different themed outfits for each character. We were confused with battle ship girls in Kantai Collection, but now there’s this new obsession over talking swords that are actually beautiful anime men?! 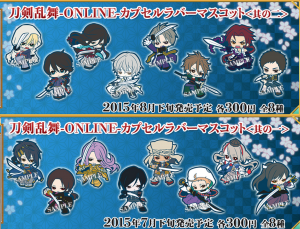 Your swordsman collection isn’t complete unless you have these ToukenRanbu rubber strap gashapon! And perhaps if these unrealistic mean don’t float your boat, you can always find real wartime heroes like these Tenka gashapon below! Ready to Obsess over Gashapon? Regardless of what you like, there will be a capsule toy series for you. Gashapon are a staple of Japan and, with new ones coming out constantly, there will always be something new to collect. For instance, sometimes you just really need keyboard plant sprouts to disturb your work. If you’re not in Japan but want to get your hands on these cute/weird/cool toys, then check the FROM JAPAN store to buy your favorite from a huge selection! Heck, you can even get a miniature gashapon of a gashapon!